Edinburgh Science Festival is an educational charity that aims to inspire all ages and backgrounds. 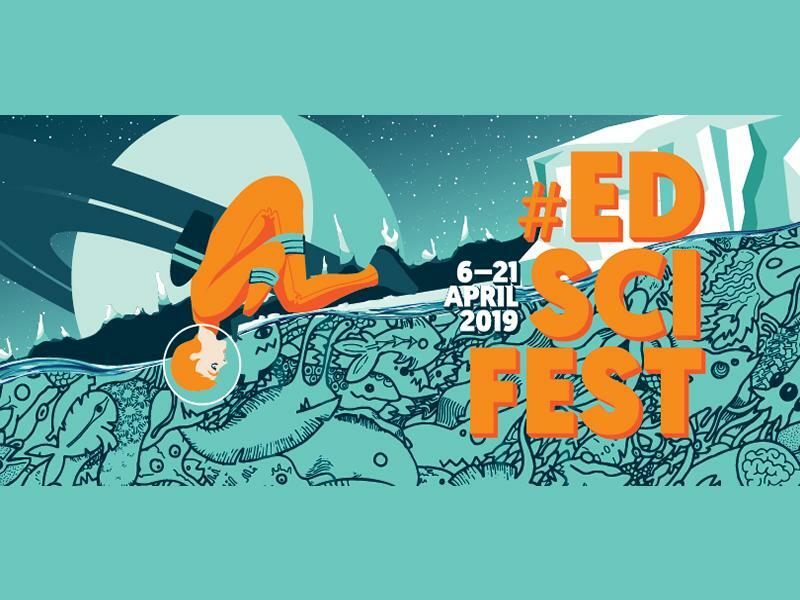 The Science Festival will return in 6–21 April 2019 with the theme of Frontiers. Inspired by the 50th anniversary of the Moon landings, the 2019 Festival theme is Frontiers, exploring the boundaries of knowledge and the spirit of adventure and enquiry that drives science, technology, engineering and maths. Within this theme, specific areas of focus will include Healthcare Frontiers, Engineering Frontiers, Digital Frontiers, Environmental Frontiers and Planetary Frontiers. They provide a platform for some of the brightest minds in science, technology and engineering to share big and exciting ideas from the cutting-edge of their research domains. Sorry, but we have no upcoming events for Edinburgh Science Festival. If you know of an event taking place at Edinburgh Science Festival or anywhere else in Edinburgh tell us about it and we'll list it on the website, for free! The Architecture Fringe is an independent, contributor-led series of events and projects across the arts. Audacious Women Festival is a chance to break personal or institutional barriers, and to celebrate audacious women everywhere. Burns Unbroke is a new contemporary multi-arts festival offering diverse creative responses to Burns. Founded in 2004, Edinburgh Art Festival is the UK's largest annual festival of visual art. The Edinburgh Festival Fringe is the largest arts festival in the world and takes place every August for three weeks. The Edinburgh Festival of Cycling is a real showcase for all aspects of cycle culture and the City of Edinburgh. The Edinburgh Festival of Indian Films & Documentaries returns on 24th to 26th November. The Edinburgh Horror Festival, or EHF as all the cool kids call it, is a multi-art-form event running over the weekend before Hallowe'en each year in Edinburgh. The Edinburgh International Book Festival began in 1983 and is now a key event in the August Festival season. Edinburgh International Children's Festival of performing arts for children and young people. The Edinburgh International Festival presents three weeks of the finest creators & performers from the worlds of the arts. Edinburgh International Film Festival is renowned for discovering & promoting the very best in international cinema. 2019 brings you the Edinburgh International Improv Festival and will be Scotland’s first and only Improv Festival, held in the beautiful and historic capital city. Edinburgh International Magic Festival is an annual arts festival and is the UK’s largest magic event. The Edinburgh Iranian Festival is a non-political showcase for world-class Iranian culture. Set up in 1978, Edinburgh Jazz and Blues Festival now presents high quality musicians from all over the world. Edinburgh Student Arts Festival is Scotland’s first ever youth-led multi-arts festival! A spectacular, six-week season of festive entertainment in the heart of the city from 16th November - 5th January. Edinburgh's Festival of Ireland is a celebration of the city`s own Irish community around St Patrick's Day each year. Three DAYS of spectacular events, incredible bands and amazing crowds from every corner of the globe. Festival of Museums is a three day celebration of Scotland’s museums & galleries with events during the day & night! The Festival of Politics returns on Wednesday 10 October 2018 for more debate, music and film! This is the 10th anniversary of Fringe by the Sea with 60 plus performances over the entire week. Formerly the Edinburgh Digital Entertainment Festival, FuturePlay is on from the 3rd to 26th August. Gather Festival, an annual festival which celebrates the diverse communities & culture of the University of Edinburgh. The Just Festival events aim to challenge perceptions, celebrate differences and promote respectful dialogue. Leith Festival is an array of colour, sound, culture and pageantry that takes place over nine days in June. Luminate: Scotland's creative ageing festival celebrating creativity as we age. Manipulate, produced by Puppet Animation Scotland is Scotland's Festival of visual theatre, puppetry and animation. Rare Books Edinburgh is a festival dedicated to rare, collectable and important books and the history of the book. Red Red Rose Street returns for 2018 with a festival of Burns’ music and words running from 25th - 27th January. Explore large and small gardens of horticultural interest throughout Edinburgh, the Lothians and all of Scotland thanks to Scotland's Gardens Scheme! Enjoy varied afternoon sessions of stimulating conversation, readings and debate with writers, artists and thinkers. The Scottish International Storytelling Festival is a 10-day celebration of live storytelling and imagination. Join us for a multi-art festival of visual and performing arts, including photography, art installations, painting, theatre, short films, live music and dance! Take One Action Film festival returns to Edinburgh 12-23 September, to celebrate the people and the films that are changing the world! Enjoy eleven days of great music at Tradfest Edinburgh 2019!